Buying A Vacation Home But Renting A Primary Home. Because of how we make 80% of our income (freelance work) and the way the economy is right now, getting a mortgage for a primary residence is more difficult than usual. I wrote about our adventures in trying to find a mortgage in this market using only 1099 income, and it has only gotten tighter out there since then. But getting a much smaller mortgage would be a piece of cake for us, so we have been contemplating picking up a vacation cabin that anyone in our families could use anytime they wanted to, we could rent out to the public if absolutely necessary (not that we want that headache at all, but if times got tough…), and is in the middle of the forest – one of our favorite places to spend time. We seem to find ourselves wandering around the National Forest each and every weekend anyway, and being able to check out of town for a few weekends a month and head to our own cabin sounds incredibly relaxing. And because of what I do for a living, I could go up there anytime to work on it, and we could even spend the entire summer there as my wife is a teacher. It is an interesting thought and one that keeps creeping into our everyday conversation. Five Best ‘Bang For Your Buck’ Places To Buy A Vacation Home. How To Save The Environment, Your Kitchen And Your Pocket Book! Tax Breaks That Homeowners Should Not Miss This Year. Avoid These Mistakes When Trying To Sell Your Home. What Neighborhood Should You Live In? Diggin’ the idea, but leaning towards the financially conservative side, I might be concerned about getting a primary home mortgage if you already have a vacation property mortgage. Since no one has a working crystal ball, I’m concerned that funds could be difficult to obtain for some time to come… unless you’re a 700+ candidate with a substantial down payment. Add this into your 1099 income confirmation problem, and you could potentially compound the problems. “unless you’re a 700+ candidate with a substantial down payment.” – That is actually us, so I think we would be ok. Valid point though Matt! We own a vacation home and from a mental health perspective, it’s the best move we’ve ever made. However, it is also a place we can live in full time or part-time in retirement or semi-retirement. In your case, I would not buy a vacation home unless it is place you could live in and work from if something happened where you could not afford both the mortgage on the vacation home and to pay rent on a full time residence. Too much financial risk. Absolutely ToughMoneyLove, hear you on that one. We would not be buying a shanty with no running water, but a regular (but small) cabin that is self-sufficient. I think it is a great idea to own a vacation home, but it would be even better for you to own your own home too , so you can start building up some equity in your home instead of paying rent. Paying rent does nothing, but go into the hands of the home owner, you might as well paying mortgages payments on the house instead of spending $1,000 per month on rent. I did something like what you are contemplating and ended up very much regretting it. 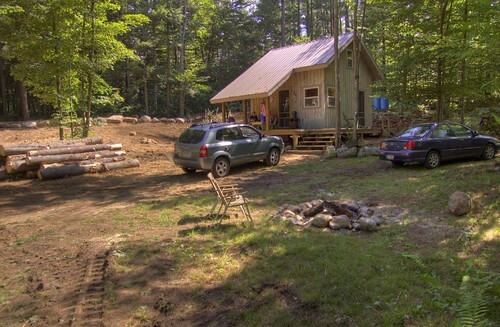 First mistake was buying a vacation cabin on land leased from the Federal Government, which went wild during the next two lease renewal periods, quadrupling the land lease and making the cabin virtually unsaleable. Obviously, you could avoid making that mistake. But the other problems might affect you. I had two homes to clean, furnish and maintain, including systems I wasn’t familiar with like wells, propane, and septic tanks. My property was at the mercy of local gangs of youth who chose among the isolated vacation cabins in the area to break into for party sites; if there wasn’t enough firewood split to keep warm, they’d burn the furniture in the woodstove rather than go out and chop some. The clean-up was enormous and really gross (I’ll spare you the details), the insurance premium increases were not pretty, and the sense of security and peace at the place evaporated. It turned out that my recreational tastes included more variety than that one cabin could provide. I wanted to visit different places, different parks, beaches, deserts and lakes instead of always forests. I wanted to take advantage of city offerings sometimes, like opera and art fairs. I wanted to see different countries. And for the price I paid for the cabin plus the upkeep, I could have enjoyed lots of different experiences and still afforded to rent a cabin for the weekend whenever I wanted. I can tell you that when a neighbor called to say there had been a fire at my cabin my heart soared. Visions of taking the insurance check and going on a world tour flashed through my mind, and when she hastened to assure me they had put it out without much damage, I almost cried. The fact that, after that put the idea into my head, I didn’t burn it down myself for the insurance money attests to my almost excessive law-abidingness or craven cowardice, not sure which. If you decide to buy, get well acquainted with the local law enforcement folks and find out what the break-in history is, and with a few full-time residents of the area who will keep an eye on the place for you and let you know if/when there’s a problem. Make sure your well’s good and your septic system’s drain field is not encroaching on someone else’s land or too close to the creek. Find out what trees are about to come down on your house. Figure out how much you’ll be paying on a yearly basis for that property, and what other recreational uses you could put that money to. The people I’ve known who have been happiest with their purchases of vacation property have been the ones who developed a regular client base for their use as weekly vacation rentals, relying on a dependable local to handle cleaning, re-stocking, etc. If anyone is already doing that in the area you’re interested in, maybe it would be worth renting for a week or two just to check it out. I have a family friend that did this with a beach rental. It was 10-15 years ago, but it worked out really well for them. They rented it when they weren’t there, which covered the mortgage, and eventually went on to buy their own home. If you have the income to make it work and will be able to be there enough to make it worth it weigh the possible consequences. I’m with Mr. on this one. A small place that is livable if you need it to be — and that offers an escape is a great thing. My husband and I were lucky enough to buy last year. I know that this year, with 1099 income 90% of our income, our 700+ score and 10% downpayment wouldn’t come close to cutting it on our home. But we would still be able to get something smaller elsewhere. Good luck with your decision-making! Absolutely Miranda – we would not have any problem getting this small of a mortgage, and it would definitely be livable full-time if something ever happened. Thanks! The first thing I did with my wife was purchase a weekend home. I cant tell you enough how nice it is to go away for the weekend. Leave the regular day to day at you main home and get away and relax on the weekend. Does it have its draw backs? Well it does, double expenses, two homes to run. As long as you are secure enough to have these expenses it will be invaluable to you. Sleep is better. smells are better, work around the house is not a chore but a relaxing diversion from your routine. Barbecue, fire place, coddle with the wife or spend time with the kids cant beet it not the same doing these things at main home to many interruptions and when you are in main house routine is hard to brake. Go and enjoy your idea. Its something that you will always cherish and remember. Thanks John, appreciate your thoughts on this. We will start looking a little more into this as we move forward! I live in NYC, so I found this post particularly applicable. The cost of owning in NYC is quite steep, especially when you factor in property taxes and monthly condo/coop fees. Renting, even over the long term, can make a lot of sense. BUT, I don’t want to not own any property, so my current thought has been exactly yours: rent where we are, but own a vacation home somewhere else. Hopefully then you get the best of both worlds! Sounds like a plan to me William! That’s pretty much what my aunt did. She was a teacher in a major city and bought a vacation home away from the city. It worked out well for her. She spent her school breaks at the vacation home, and now that she’s retired, she pretty much lives there full time. One thing you might want to consider, though is how this might impact you when (or if) you have kids. My experience is that owning a primary residence was much more important to me after I had children. You’ll want to be able to decorate their rooms, build that play structure in the backyard, etc. So make sure you’ll still be able to obtain that primary residence mortgage down the line. As a freelance writer in the Upper Midwest, I’m in very much the same situation. My husband and I both freelance, and we have been dreaming of buying a cabin in northern MI. They’re dirt cheap right now, (our local MI economy has tanked big time) and it’s incredibly tempting to buy when prices are so low. We’ve been aggressively saving to pay off our mortgage, which we’ll do at the end of next year, so if prices can stay low until 2010 we could just take out another, much smaller mortgage and do it then. It’s hard to wait, but the thought of two mortgages is pretty scary, at least to me! Absolutely Lynnae, something to keep in mind if we have kids! Thanks Heather, appreciate the support! What a nice vacation cabin you got there, not only you are saving your money but also you have find a good place to relax and do your work even you are on a trip. Renting is good as long as you are working on a different places.